The HSC515 is a code hopping decoder designed for secure Remote Keyless Entry (RKE) systems. The HCS515 utilizes the patented KEELOQ® code-hopping system and high security learning mechanisms to make this a canned solution when used with the HCS encoders to implement unidirectional remote and access control systems. 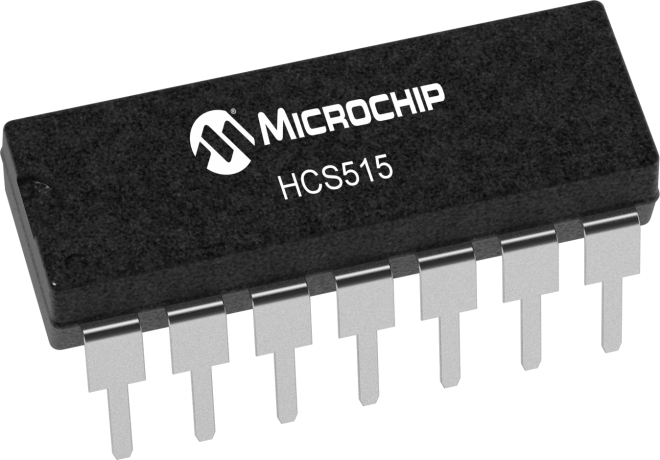 The HCS515 can be used as a stand-alone decoder or in conjunction with a microcontroller through serial or parallel interface. The manufacturer’s code, encoder decryption keys, and synchronization information are stored in encrypted form in internal EEPROM. The HCS515 operates over a wide voltage range of 3.0 volts to 5.5 volts. The decoder employs automatic bit-rate detection, which allows it to compensate for wide variations in transmitter data rate. Sophisticated error checking algorithms are built in to ensure only valid codes are accepted. Typical applications include automotive remote entry systems, automotive alarm systems, automotive immobilizers, gate and garage openers, electronic door locks, identity tokens and burglar alarms. HCS515 is available in 14-pin DIP/SOIC packages. Full-featured decoder with serial and parallel interface. On-chip 1Ktransmitter and 1K user EEPROM.